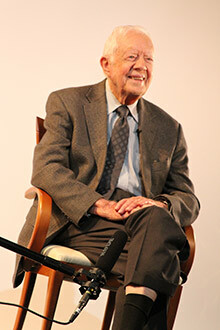 President Jimmy Carter, Emory University Distinguished Professor, visited campus Oct. 11 to give his candid thoughts on media and "loving thy neighbor" for a project created by Emory College students. Photo by Loli Lucaciu. Jimmy Carter, 39th president of the United States and Emory University Distinguished Professor, delivered this advice to a team of Emory students conducting an on-camera interview of the 93-year-old statesman earlier this month. The Carter interview, conducted Oct. 11, will be part of a larger project Barracano’s class has created to respond to divisions in the country following the presidential election. A collection of filmed meditations on love and acceptance entitled the “Love Your Neighbor Project” will eventually be published on its own website. Carter, who still teaches a regular Sunday school course at the Maranatha Baptist Church in Plains, Georgia, was a natural fit for the project. “I didn’t expect him to know so much about memes,” laughed Chatterjee.